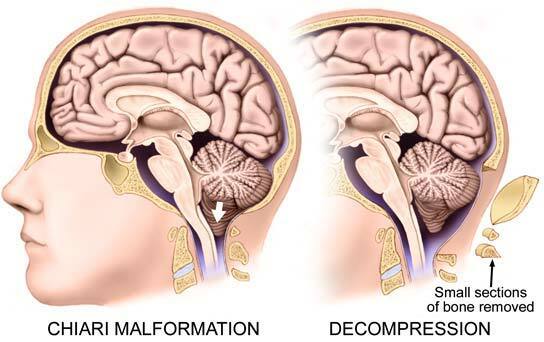 Chiari malformation is a general term used to describe a condition when the bottom part of the cerebellum (the “tonsils”) dip down into the upper spinal canal. In many cases it is congenital (present at birth). In most cases the compartment of the brain holding the cerebellum (posterior fossa) is smaller than normal. If the upper certical vertebra (odontoid process of the second cervical vertebra) ascends into the cranial compartment (basilar invagination), the canal at the junction between the brain and spine can narrow. 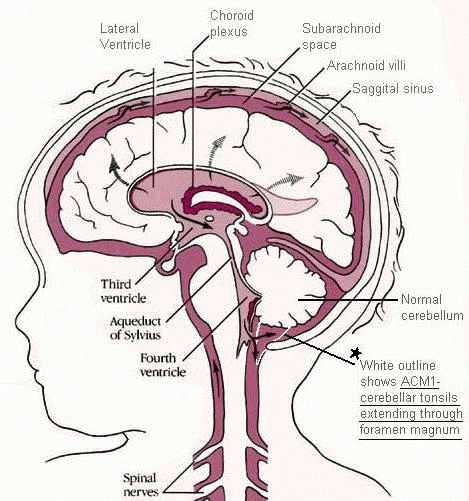 Hydrocephalus (typically due to aqueductal stenosis). Brain tumors in the cerebellum. Pain, especially headache in the back of the head, aggravated by coughing and straining. Weakness is also prominent, especially in the hands when there is associated syringomyelia. Other symptoms include neck, arm, and leg pain, numbness, loss of temperature sensation, unsteadiness, double vision, slurred speech, trouble swallowing, vomiting and tinnitus (ringing in the ears). MRI is the diagnostic test of choice for Chiari I malformation, since it easily shows the tonsillar herniation as well as syringomyelia, which occurs in 20 percent to 30 percent of cases. 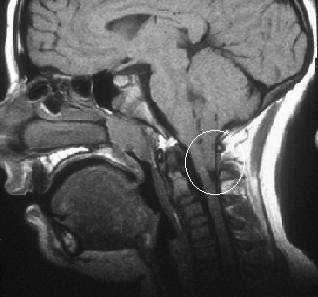 An MRI cerebrospinal fluid (CSF) flow study is often helpful for determining the impact of the Chiari malformation. CT-myelogram for diagnosis of spinal CSF leaks for cases of suspected intracranial hypotension, or syringomyelia in the absence of Chiari malformation. The aim is to remove the back, lower part of the skull bone, plus the back of the first cervical vertebra. This widens the “bottleneck” in order to allow CSF flow around the “cork.” This decompression is often accompanied by a duraplasty, a procedure to expose the coverings over the cerebellum, thereby also widening the fluid space. 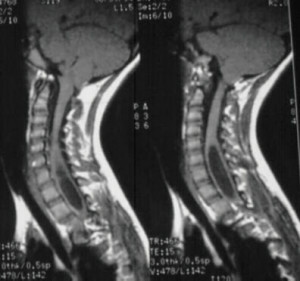 Removal of the odontoid (part of the second cervical vertebra) in cases in basilar invagination.